On December 6, 1876, in the small town of Washington, Pennsylvania, the corpse of Baron Joseph Henry Louis Charles De Palm went up in flames in an event billed as the first cremation in modern America. Supporters hailed the event, the first cremation in modern America, as a harbinger of a new age of scientific progress and ritual simplicity. Opponents denounced it as Satan's errand. Reporters too were divided. Some wrote up the story as a tragedy, others as a comedy. Either way, the event was a grand triumph for the U.S. cremation movement. All that and more might have come to pass under more auspicious circumstances, but neither economy nor society cooperated with the prophesies of this doctor-in-training. Traditional Christianity was strong. The preacher/singer team of Dwight Moody and Ira Sankey would soon bring revivals to major American cities. The depression that had hit when the banking house of Jay Cooke and Company failed on September 18, 1873, still gripped the country. Capital was scarce, and no one who had it was foolish enough to risk it on a venture as speculative as a crematory. But newsprint was cheap and the spoken word free, and cremationists used both liberally in an effort to attract reason and money to their cause. America's Gilded Age, the period of rapid social and intellectual change spanning the years from the end of the Civil War in 1865 to the 1890s, has been called an age of debate. Lincoln traded barbs with Douglas. Robert Ingersoll, America's most famous agnostic, took on clergymen of all stripes. Should women be allowed to vote? Should baseball games be played on Sundays? Was Darwin right? The Bible true? Each of these topics was vigorously debated on the rostrum and the editorial page. So, too, was whether to bury or to burn. In the burial versus cremation debate the cremationists bore the burden of proof. They were trying to overturn the time-honored tradition of burial, so it was their job to advance arguments and rebut critics. Two cremationists who took up this challenge in 1874 were Persifor Frazer, Jr., and the Reverend Octavius B. Frothingham. Frazer read "The Merits of Cremation" before the Social Science Association of Philadelphia on April 24, and Frothingham delivered a sermon on "The Disposal of the Dead" in New York City on May 3. Together these texts illustrate how America's early cremationists utilized the idioms of both theology and sanitary science, merging the ancient queen of the sciences and one of the newest modes of scientific inquiry into one overarching argument. According to these two men, a sanitarian and a preacher, burial presented both a danger to public health and a threat to the spiritual life of the nation. Cremation, by contrast, promised not only a more hygienic but also a more spiritual America. The Reverend O. B. Frothingham's "The Disposal of Our Dead," delivered at Lyric Hall in New York City, was probably the first pro-cremation sermon in the United States. Although a number of prominent clerics would eventually support cremation, most steered clear of the controversy in the 1870s. But Frothingham was not like most Christian clerics. Though earlier in his career he had endorsed conservative Unitarianism and Christian Transcendentalism, Frothingham had long since moved beyond Christianity into the camp of free religion. He served as the first president of the Free Religious Association (founded in 1867 to provide "scientific theists" with an organizational home); and the appearance of his Religion of Humanity (1872) had transformed him into the most visible American spokesperson for radical religion. Frothingham's sermon, therefore, symbolized the link--a link opponents of cremation would later exploit--between the cremation movement and unorthodox religion. These two orations provide an excellent overview of the early cremationist attack on burial. Cremation, these two men argued, was superior to burial on sanitary, economic, social, aesthetic, and religious grounds. In the world according to these early cremationists, it was more hygienic, more beautiful, more utilitarian, more refined, more egalitarian, more economical, more ritually auspicious, and more theologically correct to burn than to bury. Of all these types of arguments, however, the sanitary and the spiritual loomed largest. Many early cremationists believed the death rites debate should be settled on sanitary grounds alone. But even the most committed sanitarians typically found themselves merging the arguments of science and utility with those of theology and ritual. While Frazer and Frothingham spoke from different perspectives, they arrived at one core claim: that burial polluted while cremation purified. Cremationists understood this stock thesis in two ways. From the perspective of sanitary science, it meant that burial caused epidemics while cremation prevented them. But it also meant that cremation articulated a more spiritual view of self, body, and afterlife and produced more refined death rites than the vulgar rites of burial. What is important about the foundational argument is how closely it intertwined the sanitary and the spiritual, which became in many respects two sides ofthe same coin. Whether understood in sanitary or spiritual terms or both, the claim that cremation would purify a polluted America was also socially and politically charged. Cremationists were, by and large, genteel elites, and their cause was a genteel endeavor. The movement was most popular among white, well-educated, middle-class ladies and gentlemen from the Northeast and Midwest. Physicians and sanitarians were well represented in the ranks, as were newspapermen, lawyers, university professors, and ministers. Pro-cremation ministers typically came from liberal Protestant denominations such as Unitarianism and Episcopalianism, and from more radical religious groups such as the Free Religious Association and the Society for Ethical Culture (an organization established in 1876 and devoted to redirecting Christianity and Judaism away from belief in the supernatural and toward ethical action). Women's rights supporters--among them Julia Ward Howe, Margaret Fuller, Kate Field, Margaret Deland, Lucy Stone, Elizabeth Cady Stanton, Grace Greenwood, and Frances Willard--were also friendly to the movement. And lies upon this bier. There are many morals to this story. The only one worth underscoring here is that in 1874 cremation was not only on the docket of America's genteel reformers; it was also striking a public chord and producing popular resistance. While cremationists had plenty of arguments in 1874 for the superiority of cremation to burial, they lacked a suitable crematory. This would not have been a formidable obstacle if they had been willing to follow the ancient tradition of cremation on an open-air pyre. Despite their interest in restoring to America the grandeur that was Greece and the glory that was India, however, cremationists were reformers to the core and, as such, were determined to find a better, more modern, and more scientific way. Cremation's migration from ancient India to modern America was made possible by the efforts of a few strong-willed pioneers. The man who made it technologically feasible was Dr. Francis Julius LeMoyne, a retired physician who constructed the first New World crematory on his estate in Washington, a small college town about thirty miles southwest of Pittsburgh in rural western Pennsylvania. The man who organized the rite was Colonel Henry Steel Olcott of New York City. And the man whose death made it all possible was the Baron De Palm. LeMoyne, Olcott, and De Palm were all "advanced thinkers," thoroughly modern men whose unorthodox religious beliefs and behaviors fueled the anti-cremationists' suspicion--a suspicion that would not be shaken, at least among Catholic leaders, until the 1960s--that cremation was an anti-Christian rite inextricably tied to Freemasonry, agnosticism, Theosophy, heathenism, Buddhism, and other forms of radical religion. All three were also genteel reformers, committed to uplifting the immigrant masses to an ostensibly higher level of culture and civilization (namely their own). De Palm's idiosyncratic funeral brought notoriety to Olcott and his Theosophical Society, but complicated De Palm's cremation. When the New York Cremation Society was organized in April 1874, Olcott was in its ranks. After hearing of De Palm's wishes, he promised De Palm's corpse to that society for cremation. Initially, many agreed to coordinate the event. But after plans for the funeral were made public, members got cold feet, and Olcott was left to see to his friend's cremation himself. Now in retreat, the New York Cremation Society would not reemerge until the early 1880s. Dr. LeMoyne had initially attempted to construct his crematory on the grounds of the local cemetery, but local officials rebuffed him. So he turned to his own estate. Located about one mile from town, his crematory stood atop a knoll known locally as "Gallows Hill" because it had previously served as a county site for executions by hanging. As a doctor who had witnessed the decay of dissected and exhumed corpses, LeMoyneendorsed cremation for reasons of public health. But he was also attracted to cremation's simplicity and economy, and his crematory reflected his highbrow conviction that extravagant burial rites were indecorous and immoral. A slight one-story red-brick building approximately thirty feet by twenty feet, the crematory roughly resembled a country schoolhouse. Faced with zinc, topped with a corrugated iron roof, and equipped with three chimneys, it reportedly cost $1500. Just one hundred years ago, Americans almost universally condemned cremation. Today, nearly one-quarter of Americans choose to be cremated. The practice has gained wide acceptance as a funeral rite, in both our private and public lives, as the cremations of icons such as John Lennon and John F. Kennedy Jr. show. 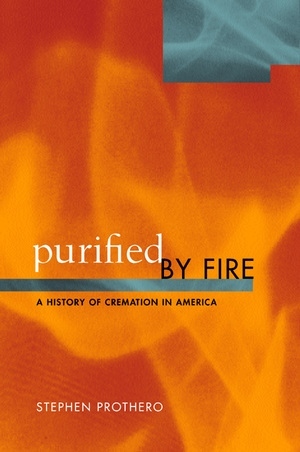 Purified by Fire tells the fascinating story of cremation's rise from notoriety to legitimacy and takes a provocative new look at important transformations in the American cultural landscape over the last 150 years. Stephen Prothero synthesizes a wide array of previously untapped source material, including newspapers, consumer guides, mortician trade journals, and popular magazines such as Reader's Digest to provide this first historical study of cremation in the United States. He vividly describes many noteworthy events—from the much-criticized first American cremation in 1876 to the death and cremation of Jerry Garcia in the late twentieth century. From the Gilded Age to the Progressive Era to the baby boomers of today, this book takes us on a tour through American culture and traces our changing attitudes toward death, religion, public health, the body, and the environment. Stephen Prothero is Associate Professor of Religion at Boston University, coeditor of Asian Religions in America: A Documentary History (1998), author of The White Buddhist: The Asian Odyssey of Henry Steel Olcott (1997), and coauthor of The Encyclopedia of American Religious History (1996).